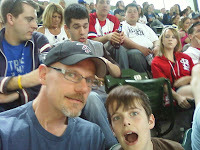 I went to the first baseball game of the year yesterday with Ben. It was just OK. 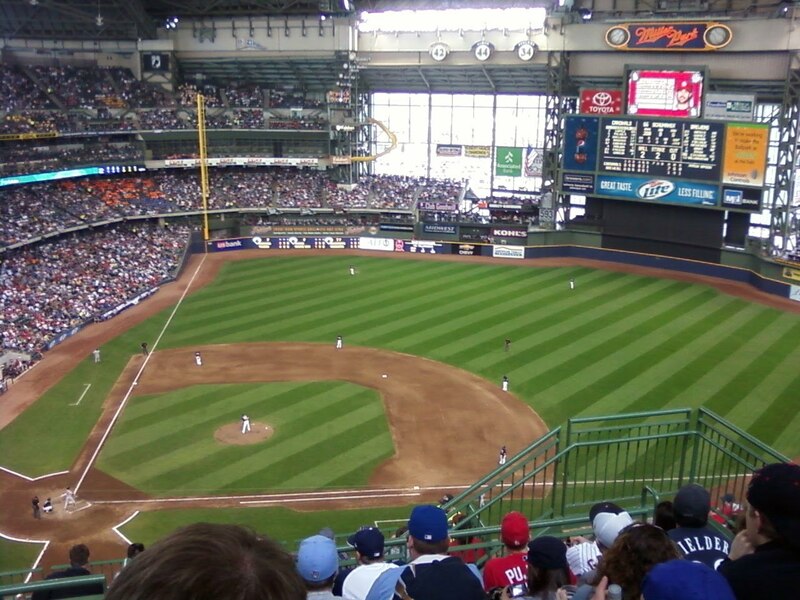 The Brewers managed to lose badly 7-1 to the Cardinals. I'm probably un-American, but it was a bit of a love/hate experience for me. I love watching live baseball. 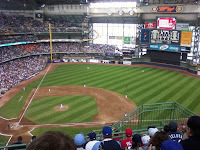 I can never sit through a full 9 inning game on TV, excluding the playoffs when either the Brewers or Twins are in them. The game moves a bit slow for my liking, but I can tolerate it if I'm AT the game. The downside to being at the game however is what it has become. It's the seven dollar beers, the blasting music, (and I mean blasting), the cramped seats, the countless drunks, the food lines, the overpriced parking and food, the traffic, and to top it all of the closed dome on a 70 degree day. See I told you I was un-American. I don't mean to be a stick in the mud, but I guess I could tolerate it more if I liked it as much as say, professional football. I think back to the days of County Stadium, when things were still overpriced, but not to the level they are now, and at least you had the outdoor thing going for you and you didn't feel like you'd been to a Def Lepard concert when it was all over and done with. Unfortunately this friggin sensory assault thing has become the norm for most sports. Part of the whole experience, I guess. To me it's just annoying. I know the last Bucks game I went to was much the same way. What ever became of going to a game, to see a game. If I wanted to dance in the aisles, I'd go to a wedding. Call me old, but I kinda miss the games where a bad organ was the only music you'd get. That's what I like about Wrigley. And then there's the issue of the drunks. Ours drifted to our section about the 6th inning or so. Evidently the tailgate party went well into the game and they got kicked INTO the stadium. While it makes for entertaining people watching at times, most of the time it's just sad and annoying too. These twenty somethings drunk dialing or drunk texting their friends, hardly know who's playing, let alone who's winning, the game. They kept getting up and moving around, unable to figure out that they had eight seats, four in front of four more in the back. At one point a guy got up and after not realizing his seat had sprung back upright, proceeded to sit on the floor (flop onto the floor is a more exact description, really). Then there was "can boy" who was drinking a Coors light out of a can next to us. I told Ben that if security ever saw that he'd get the boot. Within one minute of saying that, the "Event Staff" picked the guy out and gave him the boot. 20 minutes later, after his drunken cronies had left, likely in search of him, he returned, gazing at the crowd looking for his friends. Not seeing them, he kind of shrugged his drunken shoulders and sauntered away. So it was an experience that I'd like to have been better. No doubt it was good bonding with Ben, as we had some good laughs. Hopefully he'll remember the good and the bad will go by the by. I can say that if i don't get to another game this year, I'll really be alright with that. Getting free or reduced tickets would be the only way to entice me. I guess I'm jaded.